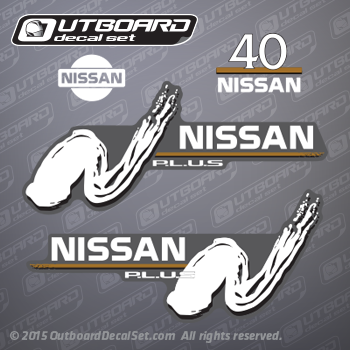 2000-2004 Nissan outboards decals 40 hp P.L.U.S. 2000-2004 Nissan decal set 40 hp P.L.U.S. Decal replica for P.L.U.S. 2-STROKE MODELS Nissan outboards from 2000, 2001, 2002, 2003 and 2004. Nissan PLUS decal - Starboard Side. Nissan Outboard decal set for 2000, 2001, 2002, 2003 and 2005. nissan engines reference NS40D2, 40 horsepower.